CAL Cargo Airlines Ltd. (Hebrew: ק.א.ל. 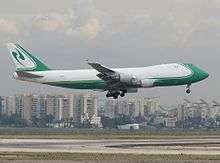 קווי אוויר למטען‎‎) is an all cargo airline with its corporate headquarters in the Airport City development of Ben Gurion International Airport, Israel. The airline operates daily scheduled cargo flights and charter services carrying nonstandard goods and general cargo internationally. 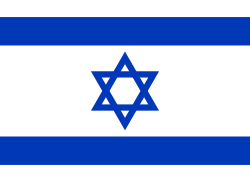 Its main base is Ben Gurion Airport, serving Tel Aviv, and it has a hub at Liège Airport (Belgium). The airline carries approximately 100,000 tons of cargo annually including all categories of nonstandard cargo: temperature controlled pharmaceutical and healthcare products, live animals, dangerous goods, oversize and overweight cargo, fresh perishable products and valuable goods including fine art. CAL was established in June 1976, starting charter operations in November of that year. Originally, the airline leased aircraft from El Al as required, however, on 1 December 1999, it began operating scheduled services using its own aircraft following receipt of Israeli government licences issued in early 1999. In 1997, CAL purchased LACHS cargo terminal in Belgium (Liege Airport Cargo Handling Services) which it is still fully owned and operated by CAL, and caters to CAL's specialty in nonstandard cargo. In 2010, CAL was purchased privately by Offer Gilboa and expanded its flight operations to include daily flights to and from JFK/TLV. Service is also available between Tel Aviv and Vienna International Airport via a codeshare with TNT Airways. Additionally, CAL Cargo Air Lines leases extra capacity between New York and its Liege hub on TNT Airways aircraft, supplementing CAL's own schedules. ↑ "Contact Information." CAL Cargo Air Lines. Retrieved on 1 January 2012. "Contact Information Headquarters C.A.L. Cargo Airlines 1 Hayarden Street, Airport City P.O.B. 271 Ben Gurion Airport 70100, Israel"
↑ "Directory: World Airlines". Flight International. 17 October 2012. p. 38.